The Department of Housing and Residence Life Services supports Carleton University’s commitment to diversity as a source of human excellence, cultural enrichment and social strength. The Department is committed to providing students with an environment that promotes equity, diversity, and inclusion and is free of discrimination, injustice, and violence. The department will take proactive and reactive steps to continually reinforce its commitment. In order to meet its commitment, the Department of Housing and Residence Life Services trains its student staff members on how to foster safe and inclusive environments. If you are experiencing a situation that makes you feel uncomfortable or unsafe in Residence, the Residence Fellow on your floor is available to you. They are connected to a network of professional supports that can help address the issue in a confidential manner. providing accommodation advice related to religion, disability, family status and pregnancy; to promote education and employment equity. For more information on Equity Services, go to carleton.ca/equity or their office in 503 Robertson Hall. For information on Carleton University Students’ Association’s (CUSA) Gender and Sexuality Resource Centre, go to www.cusaonline.ca/services/servicecentres/gsrc. For information on CUSA’s Carleton Disability Awareness Center, go to www.cusaonline.ca/services/servicecentres/cdac. For information on CUSA’s Race Ethnicity Culture (REC) Hall, go to www.cusaonline.ca/services/servicecentres/rechall. For information on CUSA’s Womyn’s Centre, go to www.cusaonline.ca/services/servicecentres/womynscentre. The Department of Housing and Residence Life Services supports Carleton University’s committment to achieving barrier free accessibility for persons with disabilities living at Carleton. 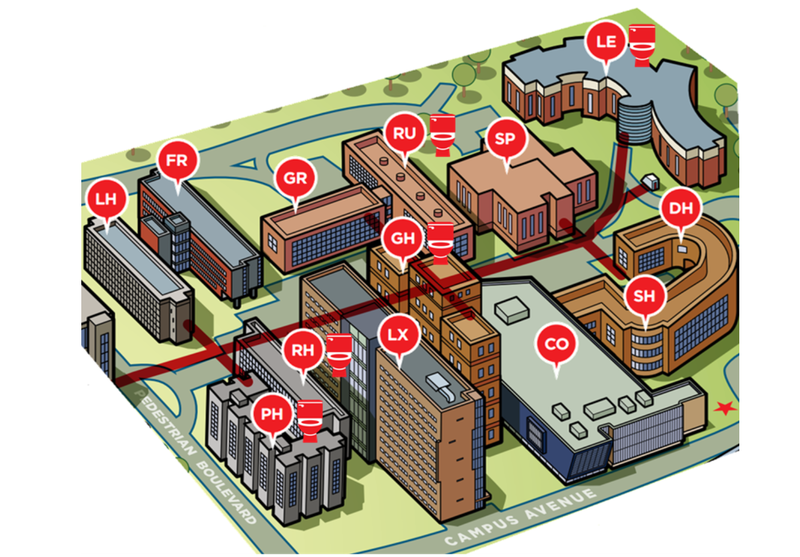 Every Residence building is connected by Carleton’s underground, heated tunnels. Most Residence buildings have elevators with the exception of Lanark and Renfrew Houses. Attendant Services: Carleton University offers attendant and personal care services, 24-hours per day, 12 months of the year at no cost to students with physical disabilities living in Residence. Students with varying levels of disability may live and study on campus with the assistance of attendants who assist them with activities of daily living, such as rising and retiring, toileting, personal hygiene, and dressing. Attendants also assist with tasks such as laundry, light housekeeping, setting up books and computers, and eating in the cafeteria. Students live in specially designed suites, which complement the accessible nature of the campus. The map below indicates which Residence buildings have specially designed suites to meet the needs of many persons with disabilities. For more information on Attendant Services, go to carleton.ca/pmc/attendant-services-program. 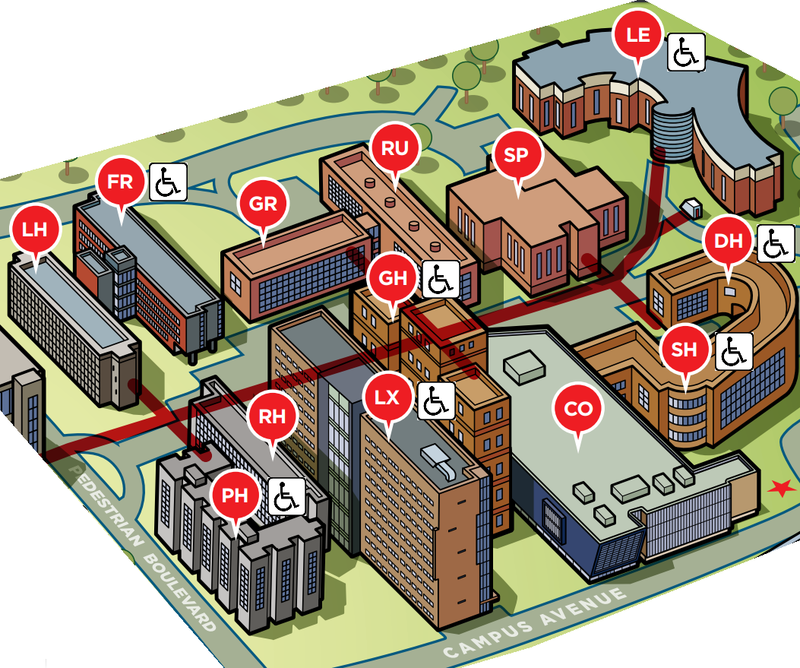 For more information on accessibility at Carleton, go to carleton.ca/accessibility. For Carleton’s Accessibility for Persons with Disabilities policy, click here. If there are any concerns about the accessibility of an event or space in Residence, please reach out to the Department of Housing and Residence Life Services by emailing accommodations@carleton.ca or visiting 261 Stormont House. By signing the Carleton University Residence Agreement and the Residence Standards, students indicate that they are willing to abide by the standards, rights, and responsibilities that come with living in Residence. For the full Carleton University Residence Agreement and the Residence Standards, go to housing.carleton.ca/standards-and-agreement. preserve the freedom of its members to carry out responsibly their scholarly work without threat of interference. What if people on my floor make comments about my identity that make me feel uncomfortable? Student and professional Residence Life Staff receive training and development opportunities related to student equity concerns, so talk to your Residence Fellow! They may be able to address the comments on the floor confidentially. If the comments persist, professional Residence Life Staff may get involved in order to resolve the issue. If I tell Residence Life Staff about my identity, will they tell others? Residence Fellows are bound by confidentiality except when they learn of intended harm to self or others. They will not discuss your identity with others without your consent. Do I have the option to live in a gender-inclusive residence? First year students should contact our Accommodations team if they have any questions about their room placement relating to their gender identity or expression. Email accommodations@carleton.ca with any questions or concerns. Upper year students living in Frontenac House, Leeds House, and 10th Floor Lennox & Addington House have the option to live in gender inclusive spaces. They must indicate this preference on their Residence Information Form (RIF). For more information, go to our Applying to Residence page.